Badass Larp Talk #14: Nice Shoes, Wanna Larp? So I was talking with my Dresden Files larp partner in crime, the lovely and talented Christine, and she mentioned a larp practice she was developing that I thought was pretty dynamite. She talked about trying to capture a character in a picture, using only a small collection of their props and costume pieces, maybe a half-dozen or so. Combined with a grand Dystopia Rising tradition begun by the inimitable Jamie Snetsinger – go ahead, just try and nimit him, I dare you – of posting pictures of costume pieces right before an event, I thought the two ideas together had a lot of potential to really make larpers focus on the physical foundation that makes up their character. I mean, a lot of players spend a great deal of time on backstories, and they spend a lot of time on their costumes and props, but they don’t always connect the two. Which is a real shame, because costume pieces are as iconic and meaningful as any part of your character, if not moreso. I mean, in many of the worlds we larpers inhabit, good gear is at a premium one way or another, and characters who live dangerous and adventurous lives are likely to have very good reasons for wearing and carrying what they do. Those of us who have been in the life for a long time also know that wonderful feeling of slipping into a favorite costume like a second skin, or how picking up that one signature prop instantly fills you with badass swagger. The players will go on and on about how they lucked out at a thrift shop, slaved for hours at a sewing machine or had this brilliant idea to adapt some existing material to suit their character, but often as not if you ask the character where they got a piece of equipment, and you get a blank look or a simple “Um, I, you know, bought it” that doesn’t go anywhere. Which is a shame – shouldn’t the character’s story about finding their gear be at least as interesting as the player’s story? So with that in mind, I’m issuing you a challenge. That’s right, you! 1) Find or make a backdrop suitable for your character and their world – the hood of a rusted out car for a dystopian caravan driver, the roots of an old oak tree for an elven ranger, a quiet library for a vampire archivist, etc. If no good location presents itself, use a simple cloth backdrop instead, but regardless, set the scene a little. 2) Pick no less than three but no more than six costume and prop pieces from your character’s wardrobe. If your character has multiple outfits, feel free to mix and match as you see fit. They don’t need to be the biggest, flashiest or most obvious pieces in your collection – just the ones that most embody your character to you. Signature pieces are great, of course, but even if it’s a ring that’s usually worn under a glove and thus generally visible to no one but you, that still works. Clothing, jewelry, gear, accessories, tools, weapons, armor, masks, footwear, whatever strikes you. 3) Lay your pieces down against your backdrop, one at a time. You can choose to try to arrange them artistically if you like, or you can simply lay them all in a row. Whatever works for you – this isn’t a photographic composition contest, after all. However, before you can lay a piece down, you have to come up with A) Where your character got it, and B) Why they wear it/carry it. (If you want to be even more ambitious, add C) Their favorite memory involving it.) The answers don’t need to be elaborate, but they should satisfy the questions. 4) Take a picture of the final array and post it – here, on your home larp’s forums, your own private blog, etc. Spread the love! If you’re feeling ambitious, include a one sentence summary of each piece’s significance. I highly encourage you to give the answers real thought, too. Not every piece has to be some sort of legendary item handcrafted by cherubs, of course, but even if it’s ordinary clothing in a modern day game where such stuff is readily available, there’s still a reason your character is drawn to it (or pieces like it). After all, a vampire lord in immaculately tailored suits is projecting a very different attitude and impression than a vampire lord in cut off shorts and a tank top. A ranger in dirty woolens and dented leathers is almost to be expected – which makes your character’s immaculately kept gear that much more interesting, don’t you think? In order to give people time to do this right – and because I have a vacation coming up shortly – let’s say the window for entries is open until 8/10. Sound good? 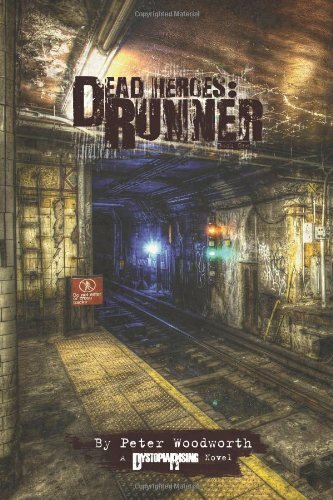 If I can get at least, say, 10 people to post their arrays somewhere where they can be seen – either here, or linking back to it somewhere else – I will judge the entries and offer the winner a brand new signed copy of Dead Heroes: Runner, the first book in my zombie apocalypse trilogy. Already have it? I’ll put up a copy of Domino, the brand new second book in the series, instead. Already got both of those? Well, I thank you for your fandom – seriously, I mean that! – and I’ll see if I can work something out. (Note: International winners may have to chip in a few bucks for postage. Sorry about that!) So what are you waiting for?